One of the most scenic routes in the United States is the Lake Michigan Circle Tour. As the name implies, it follows state highways around Lake Michigan, through Illinois, Indiana, Wisconsin, and Michigan. A special "spur route" is designated between Ludington, Michigan and Manitowoc, Wisconsin and follows the S.S. Badger carferry across Lake Michigan. The Lake Michigan Circle Tour is just one of the designated scenic road systems around the Great Lakes. The other four Great Lakes--Superior, Huron, Erie, and Ontario--each have their own Circle Tour as well. All of the tours combined comprise the Great Lakes Circle Tour. Lake Michigan is the only one of the Great Lakes that lies entirely within the United States. Among all five Great Lakes, Lake Michigan is the second largest in volume and third largest in surface area. The Lake Michigan Circle Tour is roughly 1,100 miles long and would take 14.5 hours with no stops. 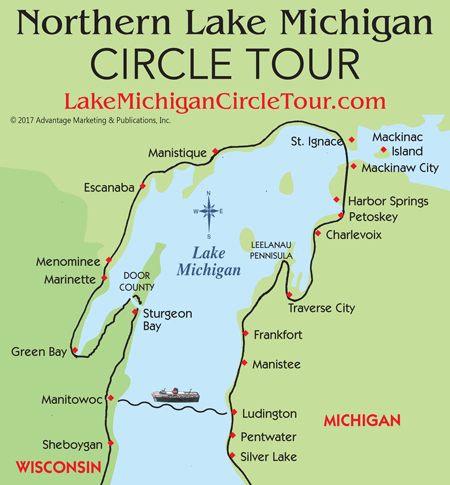 The Lake Michigan Circle Tour was part of a plan that began in 1985 and included circle tours around all the Great Lakes. It was the brainchild of Jack Morgan, who worked for the Michigan Department of Transportation. In 1987, the governors of Michigan and Indiana struck a deal and the Great Lakes Circle Tour was finalized in November 1988. In 1998, signs were posted throughout the route, covering 1100 miles of Lake Michigan shoreline. For planning purposes, and ease of travel, we suggest you might consider breaking your Lake Michigan Circle Tour into two trips: Northern and Southern. The Lake Michigan Carferry, S.S. Badger, provides convenient and relaxing cross-lake transportation, allowing you to easily travel the Northern and Southern Lake Michigan Circle Tours on separate trips. 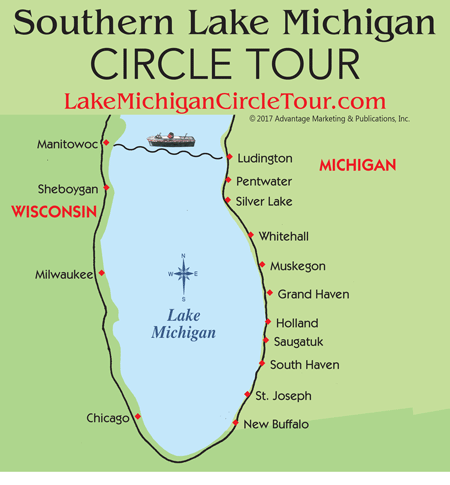 We'll start our circle tour in Ludington, home of the S.S. Badger, where you can "shortcut" the Circle Tour and take the carferry across Lake Michigan to Manitowoc, Wisconsin. While in Ludington, enjoy the beautiful beaches, lighthouses, golf courses, and the #1 state park in the Midwest--Ludington State Park. Continue north on US-31 to the Victorian port city of Manistee, home of the Historic Ramsdell Theater and the beautiful 1.5 mile Riverwalk. North of Manistee you leave US-31 and join M-22 (a breathtaking drive in the fall) which brings you to the Northwest Michigan portion of the Lake Michigan Circle Tour. Continue along the lakeshore on M-22 through Benzie County, up around the Leelanau Peninsula and to Traverse City, the Cherry Capital of the U.S. This is a very popular tourist destination, with numerous golf courses, vineyards, and water sports. After passing through Traverse City, you will continue north along the Traverse Bay and on to Charlevoix. Continue through Petoskey, one of the most beautiful regions in the state. Petoskey's downtown overlooks Lake Michigan and offers terrific shopping. Take the Little Traverse Wheelway, which connects Petoskey to Charlevoix and Harbor Springs. Continue up to the "Tip of the Mitt" to Mackinaw City. Here the Lake Michigan and Lake Huron Circle Tours combine at I-75 and cross the Mackinac Bridge into the Upper Peninsula. Don't forget to make a stop at the famous Mackinac Island, where no cars are allowed. Taste some fudge, bike around the island, and shop in the charming downtown area. After crossing the Mackinac Bridge, often referred to as the "Mighty Mac", follow US 2 west through Manistique, Gladstone, and Escanaba. South of Escanaba, you will follow M-35 to Menominee where US-41 carries you into Wisconsin. In Wisconsin, your first major stop is Green Bay, known as "Titletown" and home of the Green Bay Packers. This grand 'ole city plays host to many events, including Summer in the Park and Artstreet. After passing through Green Bay, you will follow I-43 up into the very scenic and interesting Door Peninsula, a popular tourist destination called "The Cape Cod of the Midwest" and home to numerous lighthouses. Stay in a luxury hotel, a cozy lodge or a charming bed and breakfast. And don't miss one of the famous fish boils, a Door County specialty! Heading back south on I-43, the route continues until you reach Manitowoc. This is the Wisconsin port of call for the S.S. Badger carferry as it crosses over to Ludington, Michigan May-October. It's the "shortcut" on the Circle Tour. After leaving Manitowoc, travel I-43 south through Sheboygan and into Milwaukee, the largest city in Wisconsin and famous for its breweries. There you get on WIS 32 to the Wisconsin-Illinois state border. The short stretch of the Lake Michigan Circle Tour through Illinois travels along Route 137 and then joins Lakeshore Drive (US-41) right at the Lake Michigan coastline through the suburbs of Chicago. You pass by famous landmarks such as Navy Pier, Soldier Field, Lincoln Park Zoo and Calumet Park. It's a spectacular view of the City of Chicago, as well as the splendor of Lake Michigan. The circle becomes complete as it re-joins US-12 back into Indiana. Indiana has the shortest amount of miles along the Lake Michigan Circle Tour. It follows both US-12 (also known as the Dunes Highway, closest to the lake) and I-94, which parallel each other and begins in Hammond on the westerly side. It continues on both sides of Gary, which is a major industrial area. With the steel plant opening in 1906, this city on the southern shore of Lake Michigan, offered access by ship to iron fields in northern Michigan and coal fields in Virginia. After Gary, the Circle Tour follows the Dunes Highway near the Indiana Dunes National Lakeshore. At County Line Road, you'll find a location for parking at the entrance to the Marquette Hike/Bike Trail. The Dunes Highway takes an eastern route through the towns of Burns Harbor, Porter and Chesterton. Before leaving Indiana, you enter Michigan City, the east end of Indiana Dunes National Lakeshore at Mount Baldy. You then travel northeast into Michigan. After leaving Indiana, you will enter Michigan and enjoy a beautiful drive that takes you through charming towns along the Lake Michigan shoreline. Beginning in New Buffalo (known for its variety of vineyards) the Lake Michigan Circle Tour switches to I-94 through the Benton Harbor/St. Joseph region. Here is where you'll find a Jack Nicklaus Signature Design golf course, Harbor Shores, as well as Silver Beach and the lighthouse located there. Following I-196/US 31 north, you enter Holland, known for its Dutch heritage and the famous Tulip Festival in May. Downtown Holland has various shops and eateries that will keep you entertained for hours. Heading north, the Lake Michigan Circle Tour follows its lakeshore route on US-31 through Grand Haven, home of the Coast Guard Festival. Here you can visit the beaches, book a charter boat or dine at one of the fantastic restaurants in the area. Continue up to Muskegon, home to beaches and dunes, wilderness trails, and Michigan's Adventure Amusement and Water Park. After heading north beyond Muskegon, you will leave the city traffic behind and enter a more scenic and leisurely stretch of US-31. Along this highway, there are many exits to visit the smaller communities of Whitehall, New Era, Shelby, and Hart. The Silver Lake Sand Dunes area is a great place to find adventure and fun, with both Silver Lake and Lake Michigan in close proximity. Further north you'll discover Pentwater—an artsy little community along Lake Michigan and Pentwater Lake. Throughout the summer Pentwater plays host to numerous arts and crafts fairs, as well as their big Pentwater Homecoming festival in August. Just 15 minutes north of Pentwater brings you back into Ludington, and the Southern Lake Michigan Circle Tour is complete. Plan your next vacation by following one of the most interesting routes in the country—the Lake Michigan Circle Tour.